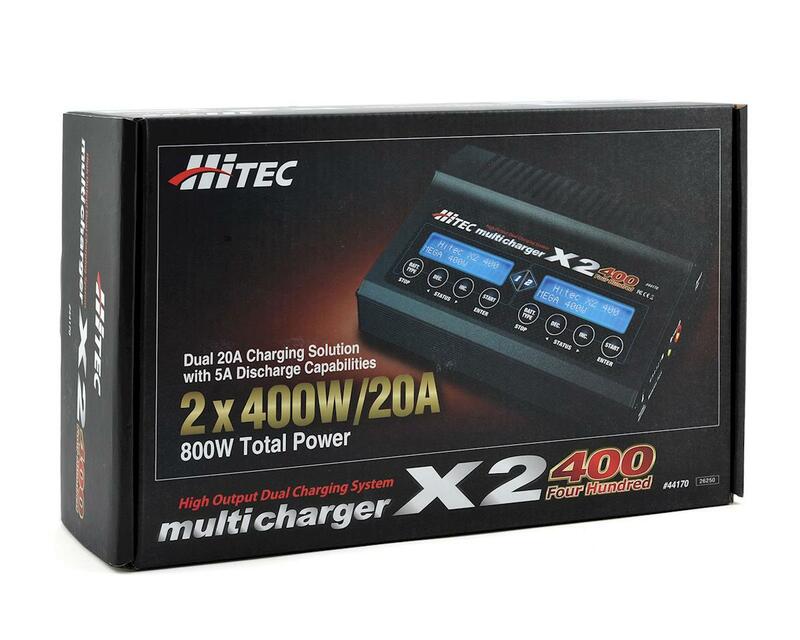 This is the Hitec X2-400 2 Channel DC Multi-Charger. 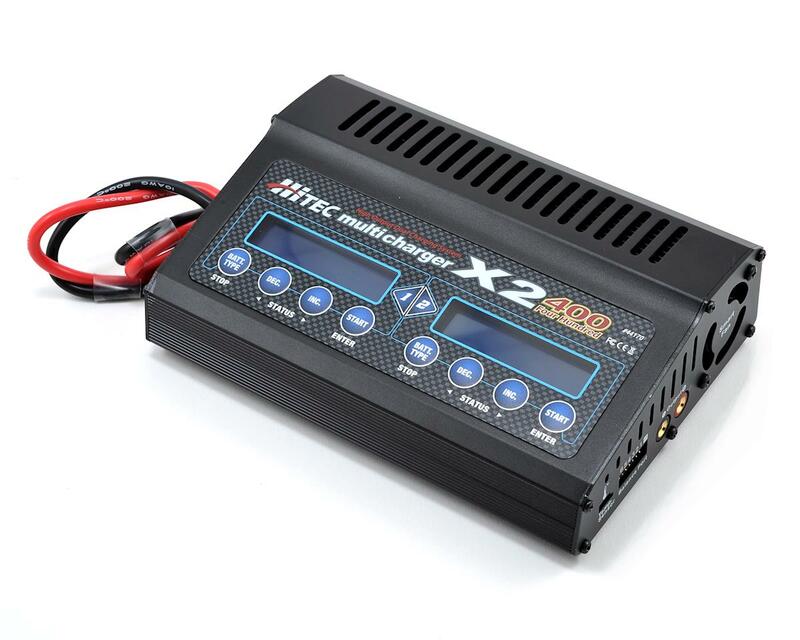 The X2-400 is a microprocessor-controlled, two-port battery charger and is capable of charging all types of high amperage batteries. Two identical yet independent 400-watt power output ports combine for a total of 800 watts of charging power. 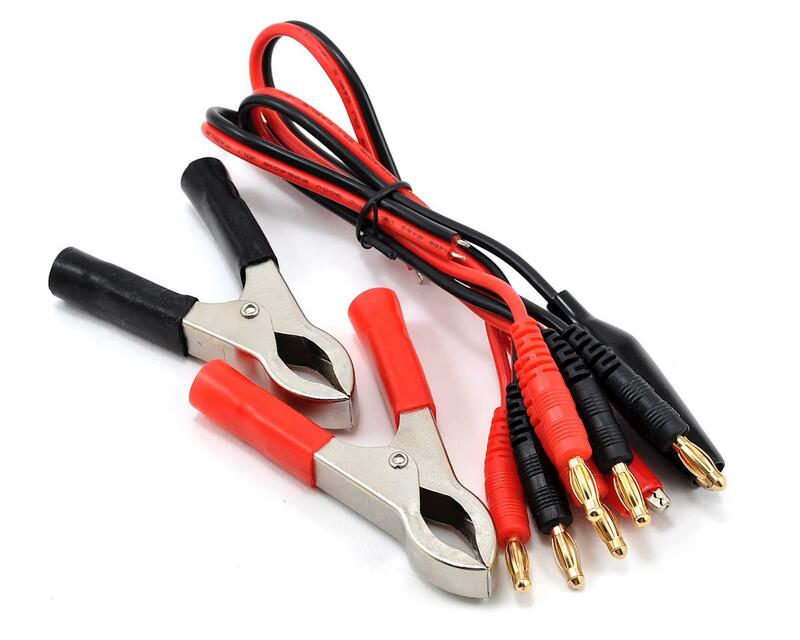 Each port charges at up to 20 amps and discharges at 0.1-5 amps, offering the perfect solution for batteries of all common chemistries, including 1-6S Lithium (LiPo, LiFe and Li-Ion), 1-15 cell NiCd/NiMH and 2-20V lead acid packs. Additional features include internal cell balancers, high contrast LCD displays and important warning and safety functions. Designed with a stylish aluminum case for rapid heat dissipation, the X2-400 offers drivers and pilots the most powerful dual-port charging capacity on the market. Awesome charger...i currently have the hitec x4 50watt charger,and this is a great addition....it seems to balance faster and more precise...great charger to take to the track especially if you have batteries which can do a 2c or higher charge rate...i can run 1 battery all night long with this setup..if you are shopping chargers definitly consider this bad boy....best buy for your money..2 channels both 20amp charge capable.. I LOVE this charger! I mounted it permanently on top of a 1000w desktop PC power supply with a hotwired power signal (easy mod) and hard-wired it directly into the 12v rail. The result: it's very portable, the whole rig comes on with the flip of a single switch, and best of all, I don't have to carry around a bunch of wires. I purchased this charger in February 2016. I chose this charger because it comes from a reputable company that has been around for a long time and other owners have had good things to say. 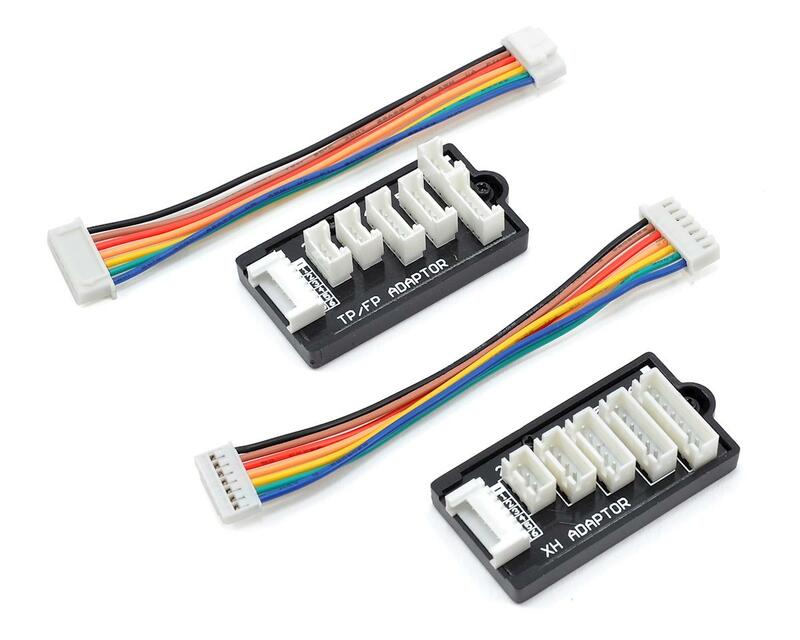 I'm really not sure where my issue lies...is it with Hitec or with AMain Hobbies?? When the charger arrived at my door and I opened it up I noticed something strange. The clear plastic protective film that cover most electronics screens when you first unbox them was very wrinkled and barely holding on. It was quite apparent to me the film had been removed once before and set aside. I know that this is abnormal from experience. My second red flag came when I powered the unit for the first time and noticed that it was already programmed for a 6s LiPo. This is highly unusual since upon first powering a new unit there are several set up menus you have to navigate and set. I grew quite agitated to say the least but I was in desperate need of a charger. My own stupidity...I'll admit. Rather than call AMain and ask why they sold me a used charger and represented it as new, I just put it into service. Exactly three month to the date of purchase the charger fails without warning!! Mind you this charger has always been used in doors and never subjected to harsh environments or extreme use. Furthermore, I've never charged above 1c with this unit. I gave it absolutely no reason to fail. I have never pushed the unit to where it warmed above room temperature. I found myself screwed because AMain washes their hands of you in these circumstances and any such repair or replacement work shall be directed at the manufacturer. Now I have been forced to purchase another charger while I wait two weeks before Hitec can even get around to troubleshooting it. No telling how long it will be away. I am very disappointed in AMain. I considered myself a loyal customer until now. I have spent thousands of dollars here just this year alone and they send me a second rate, used piece of equipment that has let me down. Not sure if it is as a result of faulty manufacturing or misuse/abuse by AMain before re-boxing it and selling it to me (I vote for the ladder). I never dreamed a company such as this would do such things to its customers. I urge anyone to closely inspect items they receive from AMain and promptly return them if something looks amiss.